References for Northwest Water Treatment, Kent, Washington. Here are some words of appreciation from just a few of our customers. "Nice work! Super happy with you guys! I have some buddies building, too. I will be sending them your way!" "Thanks for testing the water, and telling us we can use the water now. We are so thankful for the filtration system that you did for us!" "Thanks for the install - our water tastes great!" "I am very impressed with the test results! And the water tastes sweet and fresh. Thanks again!" "In doing my research for this type of service, I was continually referred back to this agency by others because of their expertise in water filtration. The owners came to my home twice and did two different water samples and then Glenn, the owner, and his son Derrick were nice enough to sit down and explain the need for each piece of the system they recommended. The install went smooth and without any hassle. They have been extremely responsive to my questions and concerns. Derrick also explained what I needed to do to maintain the system. Professional, courteous and conscientious is how I'd describe Northwest Water Treatment Inc. I would surely recommend them to any of my friends and family." "What a difference in just 24hrs. So happy with the system. Derrick did a great and explained everything really well. Thanks again!" "… thank you for our new water system upgrade. It is so nice to be able to drink the water from the tap. Charlie said your son was very efficient with the installation and so pleasant to have around. Thanks so much." "Thank you for the check up on our polymer pump, etc. Appreciate your swift response. Hope some of my neighbors, who I have given your name and information, give you a call. Wish we had you as our well guy when we first moved in, as you would have corrected early on things we have had to live with for many years. Thanks." We Now Have Outstanding Water! "Hi Glenn, your son did a great job out here. I just wanted to say thanks. After running the water for just a couple minutes to get the non-treated water out, we now have outstanding tasting water! What a difference. Thank you very much." "Good news! Thank you again. The water is now wonderful." "We are ecstatic with the water system and good honest service provided by Northwest Water Treatment. We were extremely dissatisfied with the previous companies contacted who would not fix our old system and touted stock systems they carried. One company didn't even test the water before suggesting a system. We called Northwest Water on a Monday and the following Friday had a new system which is customized to remove iron and sulfur and provide good quality water. Quite a bit more sophisticated than the water softening system we had had for the past 20 years. We might also add that the owner and his son were on site the day of the installation from morning until 7 pm perfecting everything including fixing a leak under the house and replacing floorboards in the pumphouse all without charge. They very much stick with the estimate given prior to the work being done. These folks are the most honest individuals we've come across since our water problems started several months ago. We give them a 10 star review on a scale of 1-5!" "Thank you for your prompt service call last week. Our water looks great. Also, thanks for all the information and tips so we can better maintain the system and keep the water lookin' good. I will definitely give your name and telephone number to our neighbors. We all have the same problem with rust in the water. I know they all have expensive water filtration systems they are trying to maintain or may need to replace." 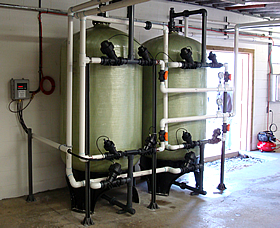 "We love our water treatment system!" "The water system is working great and we love it. Thanks." "Glen at Northwest Water Treatment earned our trust when he solved some major problems with our failing treatment system. Years later he designed a complete new system, and we now enjoy a much more efficient, simple and effective system with minimal maintenance and perfect water. We couldn't be happier with Glen's installation and service." Thank You! We So Happy With Our Well Water! "Derrick did a super job, we appreciate it. Thank you for the nice job." for Coward Seafood, Lottsburg, Virginia.